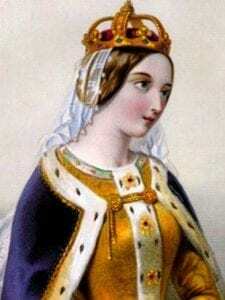 Catherine of Valois was the paternal grandmother of King Henry VII. Born on 27th October 1401, she was the daughter of King Charles VI and his wife Isabeau of Bavaria. Her father set about trying to secure an advantageous marriage for her soon after her birth. At the age of three she was betrothed to Louis, Duke of Bourbon but nothing came of the arrangement. A possible marriage with Henry, son of Henry IV of England was discussed when Catherine was seven years old. After the death of Henry IV, his son, King Henry V again suggested a marriage between himself and Catherine, but the French were not prepared to pay his dowry requirements – return of Aquitaine and the payment of two million crowns. Henry V subsequently invaded France and in 1415 won the Battle of Agincourt. After taking Rouen in 1418 the French were more amenable to discussing a peace. The Treaty of Troyes, concluded in May 1420, was to be sealed with the marriage of Catherine to Henry V. Their heir would inherit both the throne of England and that of France. 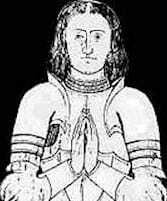 Catherine’s first son, Henry, was born on 6th December 1421. Within a year the infant prince was King of both England and France. As he grew older it would become apparent that Henry VI had inherited Catherine’s father’s mental illness. Catherine was a widow at the age of 21 years. She fell in love with Owen Tudor, who was probably the keeper of her wardrobe. Due to the fact that Owen was a commoner and also the fact that Catherine needed the King’s permission to marry they kept their liaison secret. It is believed that they secretly married, though no evidence exists as to when and where. The couple did have children: the first may have been born in 1429 and may have remained at Westminster Abbey and become a monk; the second born in 1430 was named Edmund and the third born in 1431 was named Jasper. Edmund Tudor would become the father of Henry VII. By 1436 Catherine was in poor health and was also pregnant again. She retired to Bermondsey Abbey to await the birth of her child. The baby, a girl, possibly named Margaret, was born on 3rd January 1437. Catherine died on the same day.